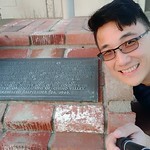 Near this site, Isaac Williams in 1841 built a large adobe home, located on the 22,000-acre Rancho Chino which he acquired from his father-in-law Antonio Lugo. The ‘Battle of Chino’ occurred at the adobe on September 26-27, 1846, during which 24 Americans were captured by a group of about 50 Californios. Located on the Southern Immigrant Trail to California, the adobe later became an inn and stage stop famous for its hospitality. Lots of people out shopping on Black Friday. I decided to visit a couple of landmarks. As you can see from the photos, the landmark is now the home of firehouse station no. 62 for the Chino Valley Fire Department; however, it is no longer in operation since they moved the fire station to 5551 Butterfield Ranch Road, Chino Hills. The fire station was used as the fire department training center but I did not see any signs that the building was being used when I visited the location.